TLDR: A fast-paced fantasy adventure that combines the heroism of musketeers, the intrigue of Amber, and the swordplay and magic of classic S&S. 3 stars out of 5 for me, perhaps more for you. This is the first book in a new fantasy trilogy by Howard Andrew Jones. I've been an admirer of Howard's work for a while, now, and in particular of his book The Desert of Souls which is a fluidly paced swashbuckling fantasy set in the Caliphate of Baghdad. @clash_bowley might remember me mentioning how this book was in inspiration to my 13 Wives campaign, and in particular the taxidermy lion animated by the Jinn. Howard is also responsible for bringing Harold Lamb back into print and is the editor of many recent collections of his work. He is also the editor of recent Conan fiction, and has written some adventure novels for the Pathfinder system. A recent mention by me of The Desert of Souls prompted Howard to reach out to me and offer an advanced reader copy of this book, which I gratefully accepted. 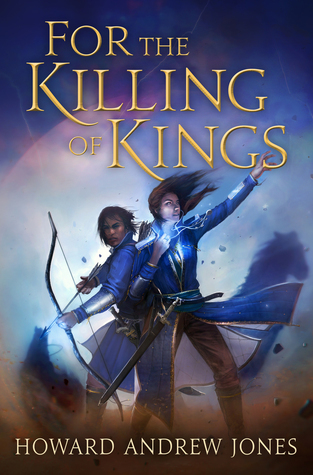 For the Killing of Kings follows the fortunes of Rylin and Elenai, two squires in the Altenerai, a group of musketeer-like defenders of the city of Darassus. Each of these squires is assisting a senior member of the Altenerai when they discover, independently, that all is not what it seems in the realm. Irion, the Sword of N'lahr, a symbol of strength that is though to be keeping the barbarian Naor at bay, is a fake. From here the reader is rapidly drawn into a web of intrigue that seems to be centred on the queen and the inner circle of Altenerai that evokes The Three Musketeers and, so some degree, The Chronicles of Amber. A number of Altenerai long since thought dead or disappeared start showing up, each seemingly with their own agendas and heading toward a probable grand clash in later novels. Aside from the books mentioned above, this novel draws on Sword and Sorcery stories for its inspiration. It's squarely centred on the heroes - in fact, I don't think there's a character in the book who isn't a hero - you won'd find any janitors, bakers, or torturers. All the characters are Altenerai, intelligent non-humans, or (late in the book) barbarian invaders. The characters move from one hazardous situation to another, fighting strange creatures, investigating ruins, confronting fellow Altenerai of uncertain motive, or fighting battles against barbarian hordes or other altenerai factions. There's an overarching mystery to be solved as well - some of which is unravelled in this book, but there's much that awaits future installments. There are many things I admire about this book, not least of which are the quality of the writing and the brisk pace of the adventure, which never seems to flag. Jones does a great job with fight scenes, and there's a fair amount in interesting magic in the book - all the Altenerai seem to have magical powers, and there's a parallel organization of people that are mostly wizards. It's basically got everything one would expect from a fantasy RPG campaign, so it will probably appeal to a broad spectrum of gamers. But that said, the book doesn't deliver the kind of fantasy that I really enjoy. I don't particularly care for de-facto heroes, for one thing. To me, a hero is an ordinary person who rises to face adversity in spite of personal risk. But we don't have any ordinary people in this book. These are all heroes in the super-hero sense - people whose unusual abilities and powers make them better than others. They never really have to question who they are, only how best to use their powers. Those are simply not the kind of people I care about. Give me a Bilbo Baggins, who adventures in spite of himself, or Sparrowhawk, who must first learn to master himself before he can do anything vaguely heroic. Give me Jorian, the reluctant king, who just wants to make a modest living but keeps talking himself into trouble. The Altenerai are very much more like Musketeers or Princes in Amber - their heroism is never really in question because it's a by-product of their power. All that's really unknown is which side they're on. Personally I’m quite fond of landscapes, because landscapes are also characters. Here we meet many nice placenames -Stock, Woody End, Bucklebury Ferry, and even The Cracks of Doom. All these names tell us something of the landscape and people within. They reveal the history, and custom, and even the sense of humour, of the people who live there. There’s a reason Middle Earth feels so deep and rich as a setting. A Wizard of Earthsea had this, too. Personally, I find that when this is missing from a fantasy novel, I lose interest quickly. I need a sense of place! For The Killing of Kings really didn't give me the sense of place that I crave in a fantasy setting. There is a setting here, and one I thought was vaguely middle-east inspired when I started the book, with place names like Darassus, Kanesh, Arappa, Erymyr. But there's little cultural consistency in the personal names, and soon the little sense of place we can derive from names is gone. Darassus itself gets very little description - its architecture, economics, the daily life of its people, are all left to the reader to fill in. This left me feeling very ungrounded, like there really was no here, here. Setting simply isn't something that Jones was concerned with in writing this novel - he wanted story, and heroes, and adventure, and intrigue. Well, the book certainly has all those things! But without the setting, I lost the sense of verisimilitude that I need to keep me grounded in a fantasy novel. Toward the end of the novel, one character asks another "Why was any of this, here, in the regular world, of interest in any way?" and I found myself asking the same question. Who are the Altenerai really defending? With the lack of ordinary people and setting, the answer must be: their own self interests. That's a very Amber answer! But it's not one that appeals to me very much. Might it appeal to you? If your name is @Michael_S_Miller, it just might. Michael is also writing S&S style fiction with a focus on heroes and storytelling, with a de-emphasis of setting on order to make those things stand out. I think there might be a lot for Michael to appreciate in this novel, in fact, both in terms if inspiration and in terms of craft. I think it has all the things Michael wants to write about, and none of the things Michael really doesn't care for, so it seems like a natural fit. So in spite of the fact that my own tastes were not served, I think For the Killing of Kings might serve Michael's very well, and so would like to recommend the book to him. Thanks for the recommendation! I will definitely check it out. My feelings on setting are complex, contradictory, and difficult to articulate. I am put off when world building (and the exposition of that world building) overshadows character and situation. But I also crave a sense of place, to give context to those characters and their situations. It's a hard balance to hit, as a writer. If it were easy to accomplish, it wouldn't be an existing challenge to achieve!